Nothing more to say. Does everything it says perfectly. Thanks for the addon! Take control of your login destinations by redirecting users and/or user groups to their proper locations. Easily assign any number of users and/or groups to an existing page or external URL with a friendly and intuitive dashboard widget. Your users get right to their specific content without any programming or special permissions. Uses native Concrete5 event listener to intercept the login event before Concrete5 redirects the user so no double redirects. Create, edit and delete redirect rules from the dashboard. Set a rule to be active or inactive. No need for .htaccess or nginx requirements so it works on all platforms. Automatically deactivates rules if a defined rule contains a page that is deleted or moved to trash. Super Admin is ignored, so site administration is ensured without redirect. If there are no login rules triggered, normal Concrete5 login behavior continues. This plugin does not provide permission based content redirects, it’s up to you to define your own page permissions with the native Concrete5 tools. 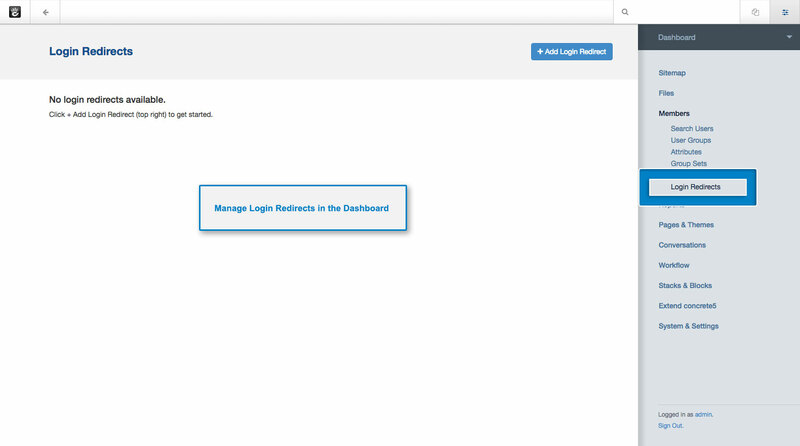 This plugin will add a new page to your Dashboard > Members area called "Login Redirects". Here you will create new rules for the redirects.